On the 2nd April Eckington School’s Y12 Young Enterprise Company iSurvive took part in the North East Derbyshire area showcase. They competed against four other schools (Dronfield Henry Fanshaw, St Mary’s Roman Catholic School, Mt St Mary’s, and Brookfield School) and managed to be one of the winning teams. They will now go on to compete against South Derbyshire teams for the title of Derbyshire Young Enterprise Company Program winner on the 7th May. •	Easter Egg Hunt survival kits. Many more ideas are currently with their research and development team. Managing Directors Ria Needham and Woody Fargher-Varney lead a team of 16 students, all with different roles within the company. 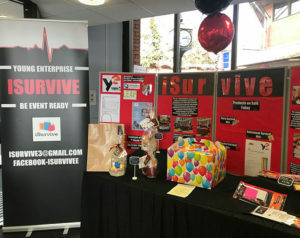 During the competition phase of the programme, ISurvive have run trade stalls at Chesterfield market, Meadowhall, and in Chesterfield Library. In addition, they have an extensive online marketing presence (@iSurvive on facebook and Instagram) which promotes their products and holds promotional competitions. 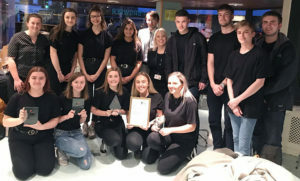 At the area final on the 2nd April, the team were interviewed by local business leaders, held a trade stall and completed a presentation in front of the Mayor and Mayoress of Chesterfield and up to 400 volunteers, parents and business professionals. iSurvive won the award for ‘Best Presentation’ on the night. The team also won awards for their marketing efforts and for the most innovative and creative idea. All members have developed important employability and entrepreneurial skills throughout their Young Enterprise journey. A huge success all round for the team members. We would like to wish them every success for the next round of the competition. Exciting times ahead!